TactiX is a unique tactical experience with a huge variety of maps and gamemodes. If you play the default gamemode called "Deathmatch"
your task is to destroy the map in a way that you are going to be the last player standing on top of it using 11 of (currently) up to 46 unqiue skills. If you fall into the abyss then you can't win the round anymore but you can still influence the game with your abilities. The final game will also going to offer a huge modding API so people can easily add their own gamemodes, skills, blocks and other features. Gravity is now under your command! In this update we included the first part of the map-scripting function. 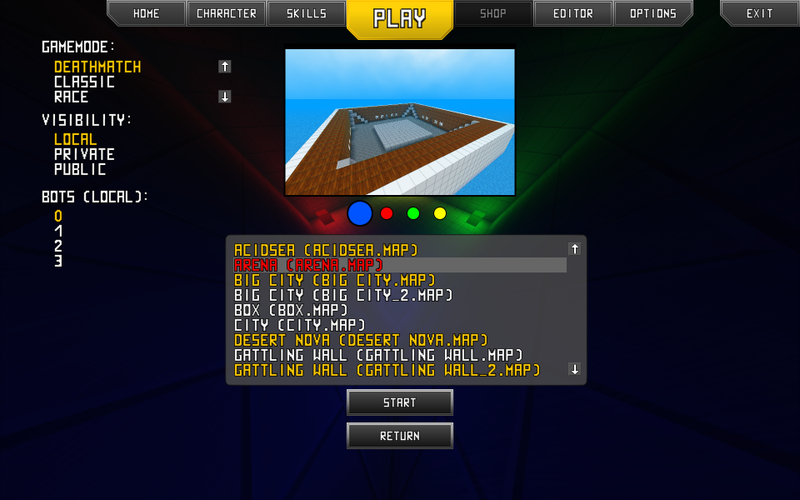 Once finished this feature is going to allow you to create your own game modes without the need of programming skills. The first thing you are going to notice when opening a map in the editor is the fifth menu item on top which opens up a list of changeable game constants. All game constants accept numbers only as input at the moment. Currently there are three constants available but there is a lot more to come. Since the modified game constants are stored in the map files themselves we had to change the map format to a more dynamic one. We converted all default maps to the new format. If you want to keep and host any of your previously created maps you have to open them up in the editor and save them again to update them. Old maps are marked yellow in the lobby and in the editor loading screen. 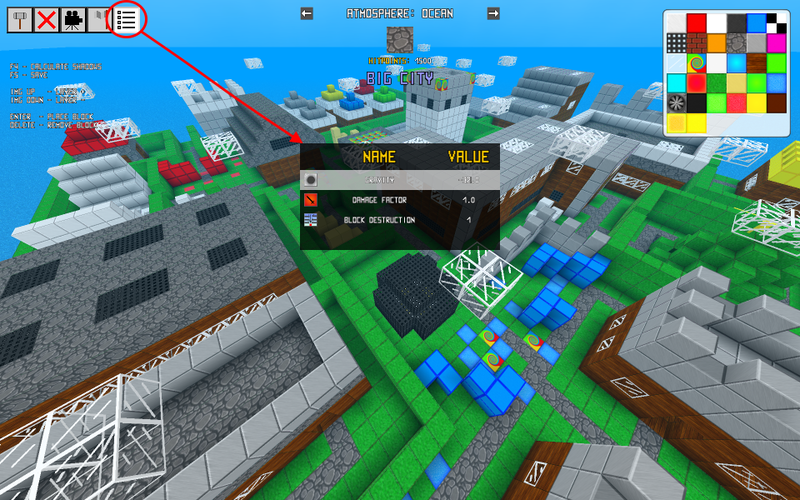 While the old map format only allowed a maximum of 255 different block types for the whole game, the new one supports up to 2.147.483.648 different block types PER MAP. So speaking of game design there is no upper limit to the amount of different block types the game can handle (ignoring hardware limitations). It is not recommended to host old maps since this is going to cause unexpected behaviour. Since our own engine is growing new features everyday we decided to finally remove the remaining parts of the slick and lwjgl utility libraries. This reduced the size of the main jar file by about ~200 kB. We also moved all shaders into the main jar file since they are very small and should only be changed by experienced users because they could turn the game into an unplayable state. As always thanks for your support and your engagement. Follow us on Twitter and Facebook for recent news. We'd be glad to hear from you. The latest update contains various graphical enhancements as well as new skills and enhancers. This article contains the result of our recent discussions about the look and feel of the final game. Expect fancy graphics and map scripting. We want to thank you all for your support and inform you about the recent events. This game is AWESOME! A great game to troll and have fun with friends! I got here because I enjoyed so much your "The prefect tower" game so much that I check your facebook. Ps: In the side of that game place something menting this game, and I PROMISS, they will come and play this game! Thank you very much, we really appreciate your support. The development is currently on-hold because we have several different projects running at the moment (most of them not game-dev related). We will continue working on the game as soon as we can invest more time in it.